G. Celant, Piero Manzoni Catalogo Generale, Milan, 1975, p. 33 (illustrated upside down). Rome, Galleria Roma II and Galleria Nazionale d'Arte Moderne, Mostra di Piero Manzoni, February-March 1971, p. 17, no. 17 (illustrated). London, Tate Gallery, Piero Manzoni: paintings, reliefs and objects, March-May 1974, no. 19 (illustrated). Cologne and Paris, Galerie Karsten Greve, Piero Manzoni, January-April 1991, p. 40 (illustrated). Manzoni's Achromes--non-formal, non-tonal, colorless zones of material nothingness--are not only the culmination the existentialist direction of much of the art of the 1950s but also the creative tabula rasa that enabled and inspired much of the development of the art of the1960s from Minimalism to Arte Povera. "We absolutely cannot consider the picture as a space onto which to project our mental scenography," Manzoni had asserted as early as 1957. "It is the arena of freedom in which we search for the discovery of our first images. Images which are as absolute as possible, which cannot be valued for that which they record, explain or express, but only for that which they are to be", he had continued. Recognizing that the existentialist trend of the Informel had run its course and responding to the Spatialist explorations of Fontana and Castellani, and in particular to Yves Klein's monochromes, Manzoni created in his Achromes what he described as a "totem". This was essentially a non-picture, a real material presence that asserted only its own formal and material properties and finally and irreparably broke down the illusive and conceptual space that has traditionally surrounded the picture plane and established the work in the real physical space of the viewer. The crucial element that allowed Manzoni to do this was kaolin. Applied to the loose pleats of the canvas its chalky enigmatic materiality and its colorlessness both allowed and enhanced a sense of the canvas actively expressing itself. Manzoni's Achromes go one step further than Klein's monochromes in that instead of having only one tone, they have, as their name suggests, none. In addition, in a development from the meandering scratches and human traces of Twombly's white ground paintings, the Achromes define their own sense of surface without any sense of a creator's presence having passed over them. The absence of any sense of an individual presence, any sense of the work having been made according to the direction or action of an individual and of the work being anything to do with a personal vision or expression, was vital to Manzoni. Responding to a Jungian view of life as being a series of responses to and interactions with a collective unconscious shared by all mankind, Manzoni believed that "there comes a point where individual mythology and universal mythology are identical. In this context it is clear that there can be no concern with symbolism and description, memories, misty impressions, of childhood, pictoricism, sentimentalism: all this must be absolutely excluded. So must every hedonistic repetition of arguments that have already been exhausted, since the man who continues to trifle with myths that have already been discovered is an aesthete, and worse." (P. Manzoni, quoted in G. Celant, Piero Manzoni, exh. cat. Musée d'Art Moderne de la Ville de Paris, 1974, pp. 16-17). Following Jung's theory of a universally shared collective library of archetypes Manzoni asserted that, "the foundations of the universal value of art are given to us now by psychology. This is the common base that enables art to sink its roots to the origins before man and to discover the primary myths of humanity. The artist must confront these myths and reduce them, by means of amorphous and confused materials, to clear images." The Achromes are the ultimate expression of such clarity. At the same time they are also, seemingly, an authorless product. The authorlessness of the Achrome was important for Manzoni, because he recognized, as Roland Barthes was later to point out in his groundbreaking 1968 essay The Death of the Author, that an author was largely a product of the social and historic conditions of his time. "The writer can only imitate a gesture that is always anterior, never original," Barthes argued. For Manzoni, the task of the artist in avoiding this inbuilt inability of the individual to create anything truly original was to be found through what he described as an "immersion in himself" until "he has got beyond the individual contingent level" to a point where he can "probe deep down to reach the living germ of total humanity". "Everything that is humanly communicable is derived from this," Manzoni asserted, "and it is through the discovery of the psychic substrata that all men have in common that the relationship of author-work-spectator is made possible. In this way the work of art has the totemic value of living myth without symbolic or descriptive dispersion; it is a primary and direct expression" (P. Manzoni, For the Discovery of a Zone of Images, 1957). One of the key concepts of Manzoni's art, the Achrome took many forms, expressing both its universality and its nothingness in a variety of materials. 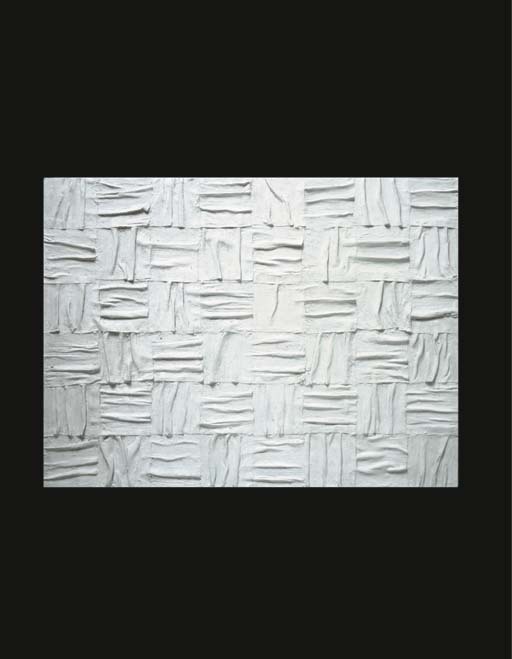 This work from 1958 is one of a number of kaolin coated canvas Achromes in which Manzoni displays the kaolin encrusted folds of the canvas in the form of a grid. Combining to form a single blank surface that is also a composite of 48 alternating squares of pleated canvas, the repetition implicit within the structure of the work asserts a sense of both multiplicity and of unity in diversity. Like Johns' gray-toned number paintings or even Warhol's later repeated silkscreen imagery, the endless systematic repetition implicit within the work is both a means of stressing the sense of surface and of generating a sense of an infinitely expanding series. At the same time the rigidity of the grid structure also enhances a sense of the conceptual significance of the Achrome as being both a totem and an ideological blueprint for a new art of universal appeal aimed at uniting humanity by resonating both unconsciously and collectively.